FALLS CHURCH, Va. — Fitness wasn’t a problem for Petty Officer 3rd Class Jovanei Taito when he joined the Navy in 2014. He’d kept in shape by playing football and participating in track and field at his high school in Kapolei, Hawaii. But as an information warfare systems technician, Taito does a lot of sitting. After long hours on the job, he gradually became less active. Less than three years after enlisting, his military career was at risk because he was in danger of failing the sea service’s body composition and physical fitness assessments. 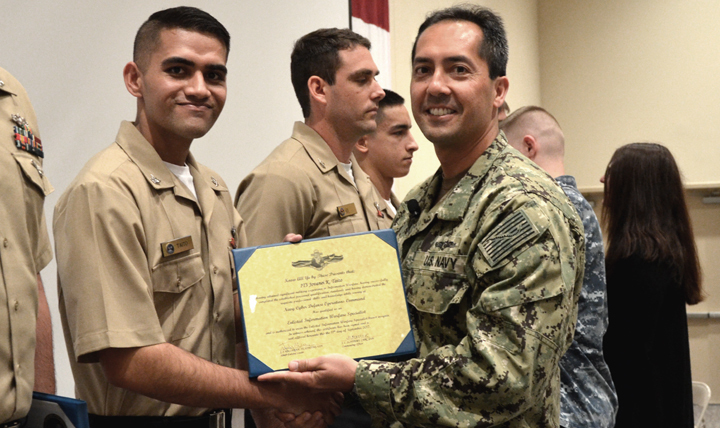 Taito, who works at Navy Cyber Defense Operations Command in Suffolk, Virginia, was referred to Ship-shape, the Navy and Marine Corps Public Health Center’s weight-management program. Ship-shape teaches service members how to make healthy lifestyle changes to comply with weight and body fat percentage standards, helping to ensure readiness. “I’m really glad I did Ship-shape,” said Taito, who continued losing weight after completing the two-month program and today is down about 60 pounds. Staying in shape is a struggle most Americans know all too well. For military members, staying in shape is a job requirement. People in uniform are significantly less likely than their civilian counterparts to be overweight or obese, according to Dr. Don Shell, director of disease prevention, disease management, and population health policy and oversight in the Office of the Assistant Secretary of Defense for Health Affairs, Health Services Policy and Oversight. Almost 71 percent of American adults are either overweight or obese, according to the Centers for Disease Control and Prevention. Generally, being overweight or obese is defined by body mass index, a weight-to-height ratio. In comparison, only about 8 percent of military members were overweight or obese in 2015, according to a study in the September 2016 issue of the Armed Forces Health Surveillance Branch’s Medical Surveillance Monthly Report or MSMR. Shell said a DoD working group is reviewing DoD and service-specific body mass and physical fitness policies and standards, with the goal of recommending revisions that will enhance the fitness and health of the overall force. The working group includes members from the Navy, Air Force, Army, and Coast Guard. Meanwhile, there’s help for service members who, like Taito, get off track. Soldiers who’ve been identified as exceeding their service’s body fat standards enroll in the Army Body Composition Program. The Air Force’s Fitness Improvement Program is mandatory for service members identified with an unsatisfactory fitness score. It’s also available for any Air Force member who wants to improve his or her overall fitness and health. For Taito, his time in ShipShape was well-spent. He’s maintained a focus on healthy eating and portion control. He also works out about five times a week: 15 minutes of cardio exercise to raise his heart rate, followed by 40 minutes of strength training to build and maintain lean muscle tissue. On his latest physical fitness assessment, he earned a “good high” overall. Your support is needed to help us to raise the necessary funds to support the Southern Nevada Fisher House – Las Vegas. Also known as a Veteran’s Family Guest or comfort house, The Las Vegas Veterans Treatment Court, The Southern Nevada State Veterans Home, The Southern Nevada Veterans Memorial Cemetery and veteran’s service organizations. The Nevada Veterans Foundation is a 501(c) (3) charitable non-profit corporation, EIN 45-3363846. Your donation is tax deductible under section 501(c) (3) of the IRS code. Donations are tax deductible to the maximum extent allowed by law. The purpose of this charitable Foundation is to help improve quality of life for members of the military, military retirees, veterans, and their families in the State of Nevada. If you would like Nevada Veterans Foundation to acknowledge this gift to a third party, please provide the name and address of the person to receive acknowledgement: And your Email address. AmazonSmile is a simple and automatic way for you to support your favorite charitable organization every time you shop, at no cost to you.